Andrew Mah has been on roll the last few weeks on the track oval. That momentum continued on Friday during Day 1 of the New Balance Nationals. The Newton North senior secured All-American status by finishing fifth overall in the Championship 5,000-meter run with an impressive time of 14 minutes, 50.50 seconds. Ohio's Chad Johnson won the race in 14:42.59. Saint John's Joshua Rahn was 20th overall in 15:28.34. Brandon Hall of Hopedale (26th, 15;34.14) and Brookline's Lucas Aramburu (29th, 15:40.46) also had solid efforts. Mah's performance further proves he's peaking at just the right time for prosperity. Back on Feb. 10, he clocked an all-time best for the 5K distance of 14:45 at the Dave Hemery Valentine Invitational. He followed that race by finishing second in the two mile at the All State Meet and third this past weekend at the New England Championship where he had times of 9:12 and 9:13, respectively. Mah has one more race left on the slate at NBN. He will compete in the first of two heats of the Championship Mile on Sunday. 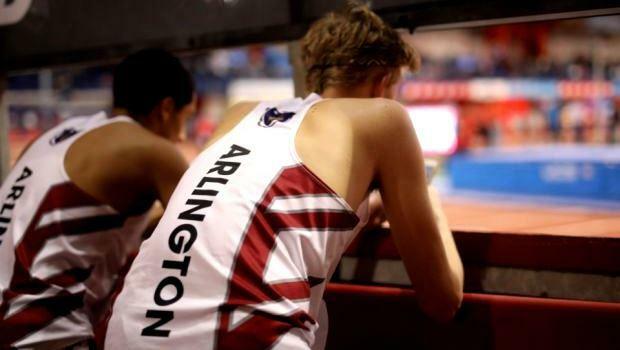 Arlington dominated the first of three heats in the Championship DMR and nearly earned All American, too. Spurred by a 4:06.81 mile anchor leg from Ryan Oosting, the Spy Ponders finished with a winning time of 10:15.23, good for eighth overall. Brentwood (TN) won the seeded heat and individual title with a near national record and nation No. 1 of 9:56.31. In the girls' 5K, Amherst-Pelham's Sophia Jacob-Townsley was 11th overall. The state two-mile champion was timed in 17:42.56. Jacqueline Gaughan of Exeter (NH), who recent established a meet record for the 2M at the New England Championship, dominated the field with her time of 16:19. The Bay State was well represented in the Emerging Elite Sprint Medley Relay with four of its team among the top six placements. Andover was second overall with a time of 4:09.73. Anchored by a 2:10.04 800m leg from Kate Mitchell, Lynnfield was third at 4:10.48. Plymouth North was fifth (4:12.05) and Franklin was sixth (4:12.74). Lincoln-Sudbury's Robert Roosa took sixth overall in the EE 800m with a time of 1:56.44. Julie Palin of Norton broke her school record by finishing 15th overall in the EE 800m with a time of 2:16.48. She broke the existing mark by three seconds!